Instructor Excellence, now in its second edition, is a classic in the field of training and performance improvement. Malcolm S. Knowles, perhaps America′s foremost authority on adult learning, called the first edition "indispensable for instructors with all levels of experience, as well as for managers and supervisors of training programs." Today, fifteen years later, Instructor Excellence is the standard for thousands of trainers and companies around the world. Donald Tosti, immediate past president of the International Society for Performance Improvement (ISPI) and founder and managing partner of Vanguard Consulting Group, reiterates Knowles′ endorsement. In his foreword of the second edition, he calls Instructor Excellence "a gem of a book, solidly grounded in performance analysis of effective instruction and offering practical guidance that will benefit instructors in any field whether novices or long–experienced." "Finally, an update and expansion of Bob Powers′ outstanding performance standards for instructors! For years I′ve used those standards for myself and training trainers. The new pre–test, CD–ROM, and everything else in this book are all nuggets of knowledge for instructors." "For close to ten years Instructor Excellence spearheaded the implementation of performance standards within my organization, with phenomenal results. Employees, if trained following the performance standards laid out in this book, will perform with excellence." 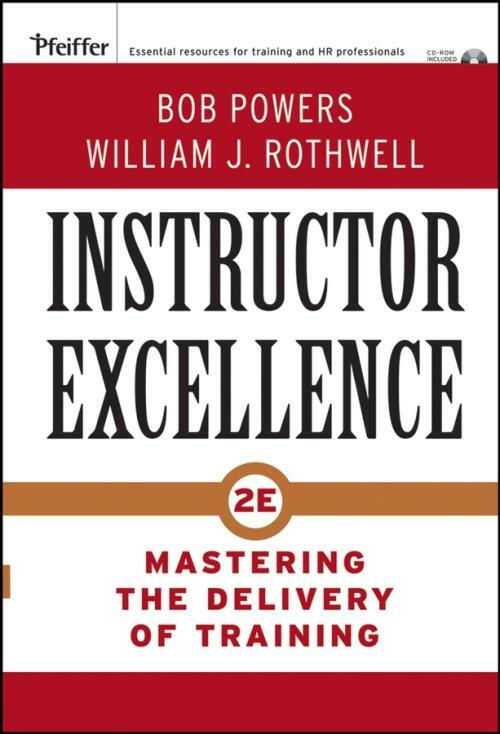 "Look no further, Bob Powers′ book still sets the standard for instructor performance excellence." "I love this book! I would like to see instructors and trainers everywhere apply the standards contained within. Our education system would be greatly enhanced." Pretest: On What Issues Do You Need to Improve Your Excellence as an Instructor? Part One: Building a Foundation for Excellence. 1. Making a Difference: The Impact of Excellent Instructors. 2. Articulating the Roles and Responsibilities of Instructors. 3. Selecting Instructors: A Skill–Based Approach. 4. Communicating Expectations for Instructor Performance. Part Two: Mastering the Tools of Instructor Excellence: Sixty Standards of Performance. 5. Being a Well–Prepared Instructor. 6. Generating Abundant Classroom Participation. 7. Building Effective Presentation Skills. 8. Adhering to Course Content and Sequencing. 9. Asking and Responding to Questions. 10. Using Training Aids to Enhance Learning. 11. Collecting and Making Sense of Evaluation Data. Part Three: Managing Instructor Excellence. 12. Observing Instructors and Providing Feedback. 13. Recognizing and Rewarding Instructors. 14. Developing Instructors and Their Careers. 15. Ensuring the Success of Instructors. 2. Competencies for Training Delivery and Instruction.